In this resident perspective, Danny Coradazzi, a resident assistant in Oglethorpe House who has lived in four different residence halls, gives us three top reasons why he has come to love O-House the most. dining just 20 feet away from O-House's front door. Whatever you like to refer to it as, it’s definitely the place to be in University Housing. Let’s be honest, I have lived in four different residence halls and while all have a different style, I have to say that O-House is pretty awesome. Its location on campus is great, and then there’s the suite-style bathrooms and wonderful staff. #1. O-House is definitely a prime location on campus. Let’s break this down. O-House is probably the best location for dining hall purposes. It’s within 20 feet of the newly remodeled Oglethorpe House Dining Commons (Shout out to Food Services and that awesome burrito line! The guacamole is awesome.) It is also equidistant to other dining halls, Bolton and Snelling. So all in all, it’s a pretty good location on campus for getting to the dining halls and getting some good food! Another great perk is the main bus stop right outside your front door. You can walk right outside the building and pick up any bus you need. Pretty ideal. And for the last location perk, if you park right behind O-House on game day weekends, you don’t have to move your car. That’s a personal favorite of mine. #2. Sweet suite-style rooms. No longer do you have to walk down the hall to go to the bathroom or wait for a shower in a community bath. O-House rooms are suite-style, which means that two rooms share a bathroom. And, our lovely custodial workers come in once a week to clean the bathroom—you can’t beat that! Another nice thing about the floor dynamic at O-House is that the floors are co-ed, which makes for a nice mix of personalities. Also, don’t forget we have a huge basement that is great for studying, programming and ping-pong, of course. #3. The wonderful staff. Obviously, I’m a little biased but the undergraduate staff is pretty wonderful. I would say we’re all funny and quirky in a good way. And, we all try to do interesting program and initiatives in the building. For example, this semester around midterms, the O-House undergraduate staff will be making goodie bags for midterms. Pretty legit, right? Collectively, we study a mix of unique disciplines and have a wide variety of majors (accounting, linguistics, history, biology, international affairs, athletic training and engineering just to name a few). This allows us to be great academic resources for residents. Furthermore, many of us are involved in student organizations and offices on campus, including VSA, LGBTQ Resource Center, UGA Career Center, the wrestling team, NABA and many more. In sum, O-House is a great residence hall and place to live. It’s in a convenient location with suite-style rooms (and shared bathrooms!) and an amazing staff. What else could you possibly ask for? Perhaps you’d like to know were to follow us on Twitter? Done. Follow O-House on twitter @OglethorpeHouse. 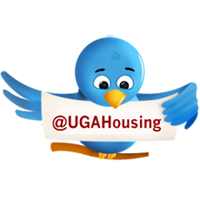 Also don’t forget to follow @UGAHousing— both accounts are resources for programs, events and general updates about the residence halls. Alright, it’s been real. It’s been fun. It’s been real fun. *The perspectives expressed by residents on our blog consist of personal opinions and are not intended to convey the official views of University Housing. 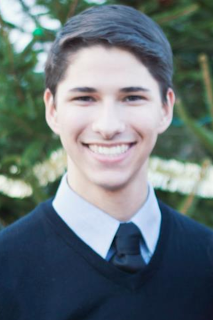 Danny Coradazzi is a resident assistant for O-House in the Hill Community. He majors in Spanish and linguistics and is pursuing a certificate in personal and organization leadership. What do you love most about living in Oglethorpe House? We'd love to know - share with us in the comments for a chance to receive a University Housing memento! Help Wanted: Summer Positions Now Available!